It would be difficult to find a more totally IN cultural, educational, and entertaining activity in Paris these days than a perfume making workshop. I recently had the pleasure of participating in a two-hour Cologne Making Workshop at the recently opened Le Grand Musée du Parfum. In a bright and lofty room surrounded by vials of perfume raw materials, and overlooking the museum entrance and neighboring rooftops, Perfume Profiler Diane Krief Thalheimer artfully led a small group of eager participants in the basics of creating a cologne. 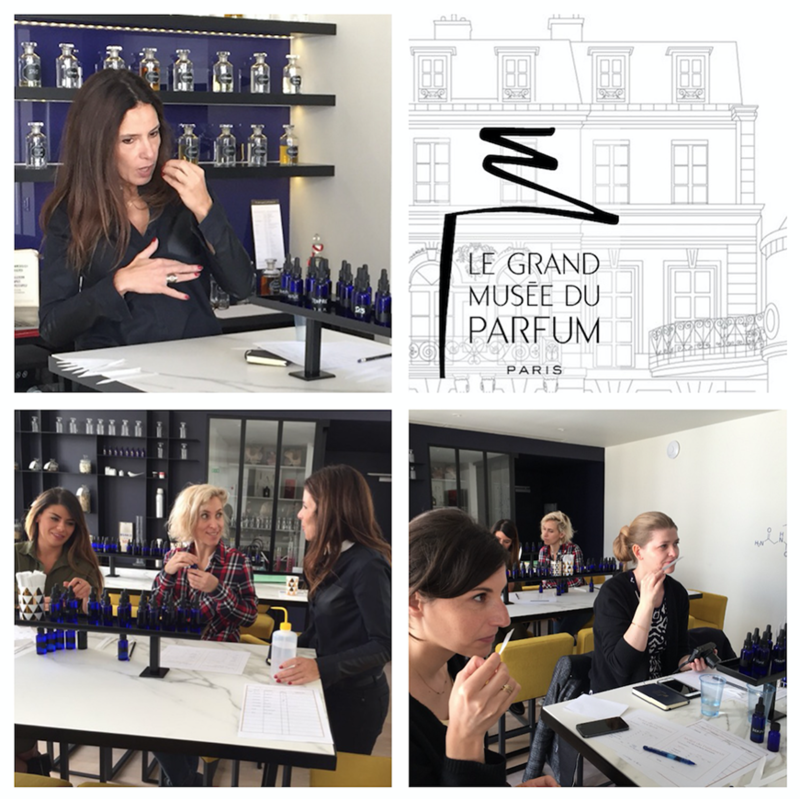 Following a brief hands-on introduction to perfumery, and the origin, composition, and primary ingredients of ‘cologne’, participants entered the magical and liberating world of creation, with just the right amount of guidance from Diane. As the workshop progressed, it was clear from the questions and discussion that members of the group were from all parts of the world, ranged from beginners to people like myself with a bit more knowledge of perfume, and most importantly, that each participant was finding her heart. Working with blotter papers, we had access to a generous selection of raw materials, which included cologne essentials such as bergamot, eau de fleur d’oranger, neroli, lavender, and rosemary, as well as other complementary ingredients such as florals, woods, leathers, and gourmands. We were invited to choose and weigh the ingredients into our formulas according to our preferences, making and noting several trials until we were satisfied with the result. During this process of intense creation, Diane circulated among us, offering tips and suggestions about choosing, comparing, gauging, and noting the relative intensity of different odors in a formula. Happy and well satisfied with the 15 ml bottle of my own creation which included some of my favorite ingredients –bergamot and fleur d’oranger to which I had added a single drop of leather, I left the workshop with a light heart, and rounded out the morning with a leisurely visit to the 4 floors of the museum (admission is included in the price of the workshop ticket). Will tell you about this in another post. It’s HUGE! After a moment of such creative labor, what could be more appropriate than to step across the street to the Hotel Bristol and relax, dream, and reflect on essential matters over a glass of champagne and light lunch at the Café Antonia? Thank you, Diane Thalheimer, Peggy Palmieri, Maïté Chanay, and Laurence Vaugeois (not in photo) for organizing such a fabulous program.